Ostomy care accessories are used by ostomates to increase performance and comfort of ostomy appliances such as ostomy bag and wafer. There are various types of ostomy accessories such as belt, tapes, adhesives, skin protection and skin barriers, irrigation sets and sleeves, convex inserts and stoma caps. 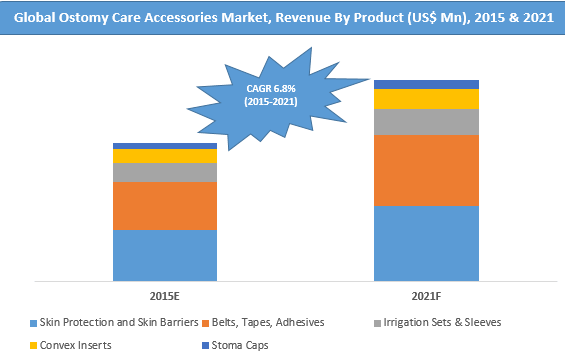 The skin protection and skin barriers product type segment are expected to be the largest segment in terms of value throughout the forecast period in the global ostomy care accessories market. Skin protection and skin barriers include wipes, spray, powder, stoma paste, strip paste, ostomy ring, ostomy seal, sheet and adhesive remover. Skin protection accessories help apply a chemical layer on the skin that helps to prevent from irritation caused by wafer adhesives while skin barriers provide flat even surface around the stoma so that wafer or other appliances can set easily. Key manufacturers focus on launching a range of skin-friendly ostomy seals that are designed to offer extra security and increase wear time while reducing skin irritation. Belt, tapes and adhesives are the second-largest segment in terms of value in the global ostomy care accessories market. These are used to hold ostomy appliances such as ostomy pouches and wafer on the body. Ostomy care accessories are used by various end users such as hospitals, ambulatory surgical centers, and home care settings. The home care settings are the largest end user segment in terms of value in the global ostomy care accessories market. This is mainly attributed to increasing online sales for ostomy care accessories and free and low-cost home delivery offered by various ostomy care accessories suppliers. This report covers the global ostomy care accessories market performance in terms of revenue contribution from various segments. This section also includes PMR analysis of key trends, drivers, restraints, and opportunities, which are influencing the growth of the global ostomy care accessories market. Impact analysis of key growth drivers and restraints are included in this report to better equip clients with crystal clear decision-making insights. The report also offers global competitive analysis for the year 2014. By product type, the global ostomy care accessories market is segmented into belt, tapes and adhesives, skin protection and skin barriers, irrigation sets and sleeves, convex inserts and stoma caps; of these, skin protection and skin barriers segment is expected to be the largest revenue contributor to the global market over the forecast period. Irrigation sets and sleeves segment is expected to grow in terms of value but at a very slow pace as compared to other segments. Belt, tapes and adhesives segment is expected to register higher CAGR in terms of value over the forecast period as compared to other segments. By end user, the global ostomy care accessories market is segmented into hospitals, ambulatory surgical centers, and home care settings. Home care settings segment dominated the ostomy care accessories market in 2014. However, hospitals segment is projected to expand at a higher CAGR over the forecast period, mainly due to increasing number of ostomates worldwide. Ostomy care manufacturers are designing various accessories that protect skin from irritation and inflammation related to use of ostomy accessories, which helps increase revenue contribution from the segment to the overall market. Ambulatory surgical centers end user segment accounted for the least share in the global ostomy care accessories market in terms of revenue in 2014 and is expected to retain its dominance over the forecast period. By region, Europe is expected to remain the market leader in the ostomy care accessories market, mainly due to favorable reimbursement scenario, product innovations and a high number of key player’s presence in this region. Asia Pacific market is projected to grow at a significant pace mainly due to increasing awareness about ostomy care accessories available in the market and rising operational activities by ostomy care accessories manufacturers in developing countries such as China, India, Philippines and Indonesia. In terms of value, markets in Asia Pacific, followed by North America and Europe respectively are expected to register the highest CAGRs in the ostomy care accessories market during the forecast period. MEA is a largely untapped market and offers companies significant growth opportunities. Lack of awareness about ostomy care accessories in certain regions is a major hindrance to growth of the market. Ostomy is a surgical procedure to create an opening from the urinary tract or intestines as a way for waste products to leave the body, that is collect by ostomy pouches. There is three type of ostomy namely colostomy, ileostomy and urostomy. Ostomy care accessories are designed to enhance wear time and improve a performance of ostomy pouches. Ostomates use these accessories as per their requirement such to avoid leakage issues, prevent odor and for support. Ostomy care accessories include products such as belt, tapes, adhesives, skin protection & skin barriers, irrigation sets, convex inserts, and stoma caps. Belt, tapes, and adhesives are ostomy accessories that help to hold ostomy pouch and wafer on the body, by enhancing pouching system adhesion. These accessories provide a sense of security during regular wear or during activities. Skin protection and skin barrier accessories are used to protect the sensitive areas around stoma sites under the wafer and allow the wafer to stick properly. Increasing ostomies among the geriatric population, technological innovation and increasing the incidence of gastrointestinal diseases across the world are major factors leading to increased demand for ostomy care accessories. Also, rising number of campaigns to raise awareness about ostomy are expected to boost demand in developing regions, thereby fuelling the growth of the ostomy care accessories market. However, increasing pricing pressure and unfavorable reimbursement scenario in certain developed countries are some of the factors expected to hamper the growth of the global ostomy care accessories market. Major trends in the ostomy care market include growing market share of domestic players, increasing partnerships between manufacturers and distributors, extensive R&D activities, increasing sales through alternative/non-conventional channels such as the Internet, reducing operating cost by moving production to countries with low labor costs and increasing adoption of alcohol-free ostomy accessories. The global ostomy care accessories market was valued at US$ 328 Mn in 2014 and is projected to account for US$ 503.7 Mn by the end of 2021. The market is anticipated to expand at a CAGR of 6.8% in terms of value during 2015–2021. Rising demand for better healthcare facilities after post-operative surgeries and increasing various gastrointestinal diseases are expected to positively affect the growth of the ostomy care accessories market across the globe. Key market players covered in this report are Coloplast Corp., ConvaTec Inc., Hollister Inc., EuroMed Inc., 3M, Smith & Nephew, FNC Medical, Nu-Hope Laboratories, Inc., Marlen Manufacturing & Development Torbot Group Inc and Cymed Ostomy Co. Major players in ostomy care accessories market focus on enhancing their global and regional presence through strategic acquisitions and mergers and operational expansion. Marlen Manufacturing & Development Torbot Group Inc.
Major players in the ostomy care accessories market focus on enhancing their global and regional presence through strategic acquisitions and mergers, and operational expansion.